Because we are dedicated to promoting connections throughout our community, we open our beautiful space for rentals. 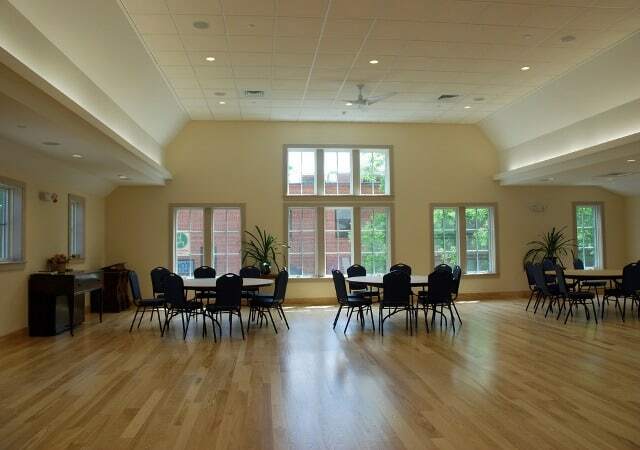 Our Sanctuary, Social Hall, Conference Room, Commercial Kitchen and other rooms are available for concerts, recitals, weddings, receptions, memorial services, lectures, seminars, conferences, meetings, and other events. The building is fully accessible with a ramped entrance to the upper level, restrooms located on both levels,and elevator access to both levels and the Sanctuary chancel. Reduced rates are available for long-term rental agreements. 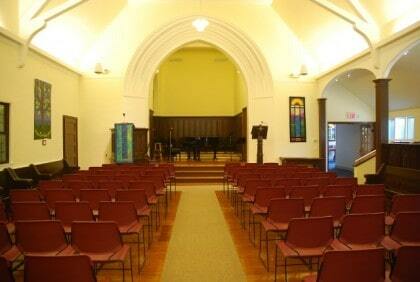 Our Sanctuary is a beautiful historic space on the upper level measuring 25’ x 36’ with seating for 140. 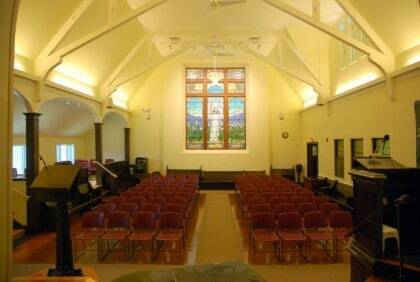 The space includes a raised “stage” for performances with a Samick baby grand piano and a Steere & Turner 320 pipe organ (manufactured in Springfield, MA in 1886 and formerly located at the old chapel at UMass Amherst). The space is overlooked by a Tiffany stained glass window entitled “Angel of the Lilies” created in 1889 and recently restored in 2014. The space is air-conditioned and includes overhead fans, overhead lights, spotlighting, and indirect cove lighting. A sound system is available with stationary and wireless microphones connected to overhead speakers. Our Social Hall is a stunning new space on the upper level measuring 36’ x 40’ with seating for 130-150 seated, or 120 with tables and chairs. The space is air-conditioned and includes overhead fans, overhead lights, and indirect cove lighting. 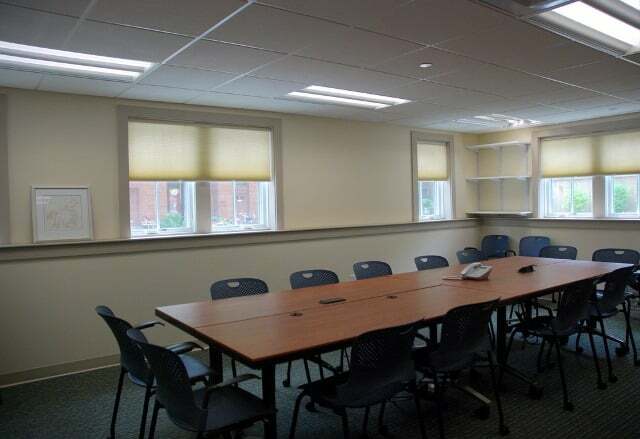 The space includes a large flat-screen wall-mounted television with HDMI ports available at the front and rear of the room – perfect for business meetings, conferences, or seminars. With the tables and chairs stored quickly in nearby closets, the open room is ideal for dance, ballet or yoga. Our commercial kitchen, located just off the Social Hall, includes a dishwasher, gas stove, gas oven, and convection oven. We have ceramic plates, bowls, and mugs and beverage glasses available for use. Five 8’ Banquet tables are available for food, beverages, or literature. 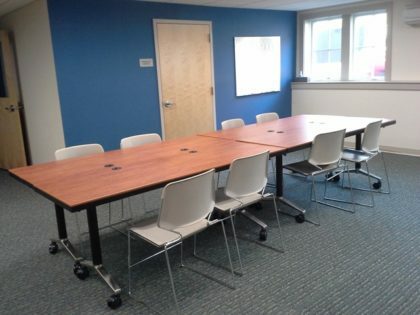 Our Conference Room, located on the lower level, includes a large conference table with power outlets and seating for 14. Wall-mounted flat-screen TV with HDMI port on conference table is available for power-points and other laptop applications. The space is air-conditioned well lit with windows and overhead lighting. 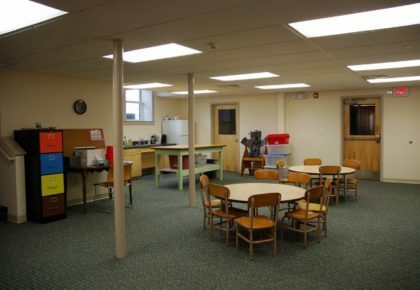 We have several other spaces available for rent with conference tables, play areas, restrooms, and kitchenette. Dedicated office space is available with long-term rental of play areas. Inquire for rental rates.